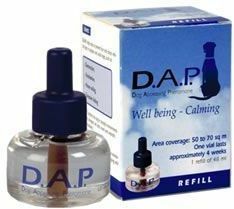 D.A.P stands for Dog Appeasing Pheromone. The appeasing pheromone is naturally released by all lactating mammals to comfort and reassure their offspring. In dogs, the canine appeasing pheromone has not only been shown to help puppies, but also to have a comforting influence on adults dogs helping them to be more resilient and cope appropriately with change.